Yes! you may be knocked down many times by challenges of life but refuse to give up for there is a sweet story at the end of the journey. Many have been knocked down and stayed down because of the lack of courage to rise and continue the race. They gave up so easily even when they were at a stone throw to their destinations. Don’t join them. Persevere in the face of diversity and keep going when faced with problems of life. You may lose some battles today but you will win the war if you refuse to give up. The fact is that, you will be knocked down on many occasions and when you are, just look up to the Creator that can lift you up to continue the journey and guide your steps. 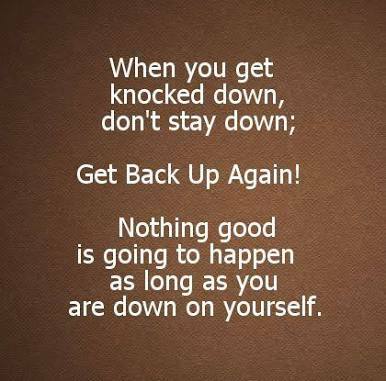 You don’t need to be depressed and give up because you are knocked down. Arise from the depression in which circumstances have kept you through divine help and rise to a new life so that you can complete the race successfully. Instead of staying down there be inspired to get up to and reach up.